C+ - Uli Edel's blood-spattered marathon retelling of the Red Army Faction's rise and fall succeeds at establishing a fitting mood of social disintegration and open intra-cultural warfare. 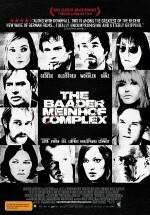 Feverishly tearing through two decades of history while piling on endless, brutal setpieces, The Baader-Meinhof Complex foregrounds thrills and atmosphere, while neglecting character and context. Writer Bernd Eichinger, who scribed the captivating Downfall, at least acknowledges the notion that the RAF was the ugly endpoint of the post-Nazi generation's recoil from fascism. The violent radicals depicted in Complex, however, are caricatures of unquenchable rage, not the best proxies for psychological delvings or an exploration of the origins of revolutionary zeal in affluent societies. What Edel delivers is a relentless film that works primarily as grim entertainment, albeit one that non-Germans may have difficult absorbing, as the historical arcana come fast and furious. Yet even as a depiction of revolution as process, Complex falls far short of last year's mesmerizing Che, which was both more artistically daring and more coherent. While Edel is adept at conjuring the madhouse spirit of the RAF's murderous glory days, Complex is undemanding globetrotting drama at bottom, a grueling thriller with a dash of chilly Teutonic style.